The objective of this conference is to bring together experts in Harmonic Analysis and Partial Differential Equations to discuss latest progress in these closely related fields. The academic program will start on the afternoon of September 28 and end on the morning of October 1. Please see Program and Abstract (PDF). A banquet is scheduled on the evening of September 29 (Tue) at Restaurant HANANOKI in Nagoya University. All the participants are welcome, and the fee is 5,000 yen (3,000 yen for students). Please sign up for it by 15:00 on September 28 (Mon) at the registration desk of the conference. An English guided bus tour is planned on the afternoon of October 1 (Thu). We will visit Noritake Garden where we will observe (and even experience) a manufacturing process of high-quality ceramic tableware, and other museums to see a display of Japanese classical arithmetic Wasan and so on. Weather permitting, we will also visit Shirotori Garden where we will enjoy Japanese traditional tea, and Atsuta Shrine the one of the major shrines in Japan. All the participants are welcome, and it is free of charge. Please sign up for it by 15:00 on September 30 (Wed) at the registration desk of the conference. The bus will leave the entrance of the conference building at 12:30. Lunch will be provided on the bus. 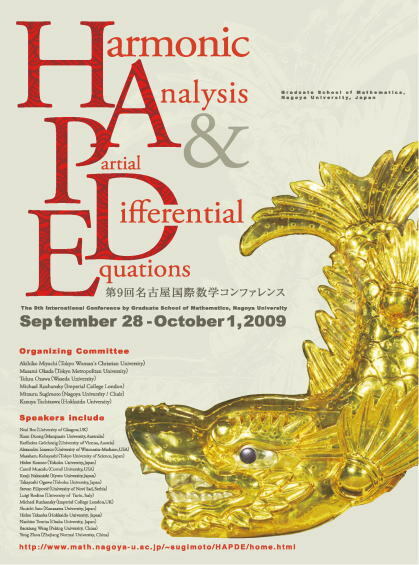 The conference is the third meeting in the series of workshops devoted to “PDEs and Function Spaces” held on February 18-20, 2008 at Osaka University, Japan, and on December 3-5, 2008 at Imperial College London, UK. 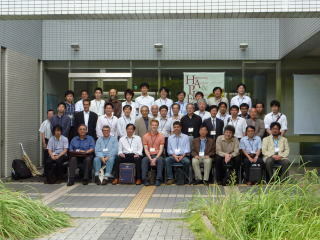 It is also the sixth meeting in the series of conferences “Harmonic Analysis and its Applications” held in Japan on November 15-17, 2004 at Osaka Kyoiku University, on August 22-24, 2005 at Hokkaido University, on March 24-26, 2007 at Tokyo Woman's Christian University, on September 2-4, 2007 at Hokkaido University, and on October 10 -12, 2008 at Tokyo Metropolitan University.